All Fields in displayconfig GTK are empty. klick on Cancel or okay, and it crash. The attached patch should stop the crashing, feel free to test and give feedback. Will this proposal fix the fact that my screens and graphics appears totally empty? or should I put it under a separate bug report? Posted the previous too quickly. This bug does also includes the blank entry fields problem. sigh. while the above patch certainly will work better in that it checks its arguments better it still doesn't address why the graphics devices and screens are not being populated. In my case, it might be the vmware devices that are not being detected or enumerated. I am seeing the both problems, the crash, and the non populated form on physical hardware. Is anyone else still experiencing this? The issue has been resolved on my Hardy install. are empty and the mouse pointer shows the loading animation. it is sort of fixed. my expectations would be that the fields would be populated by a fixed package but as of last Wednesday's patches it hadn't. even rebooting didn't cause the fields to fill in. I then installed nightly iso build from wednesday (5 march 2008). this time the fields were filled in and I was able to select screen resolutions and monitors. much improved. I wouldn't say that the configuration tool is solid though. that is probably for another bug posting. The reason the fields are blank is because displayconfig-gtk populates them by reading from xorg.conf. In modern Xorg such as shipped with Hardy, most of this stuff is now automatically detected and is no longer needed in xorg.conf. 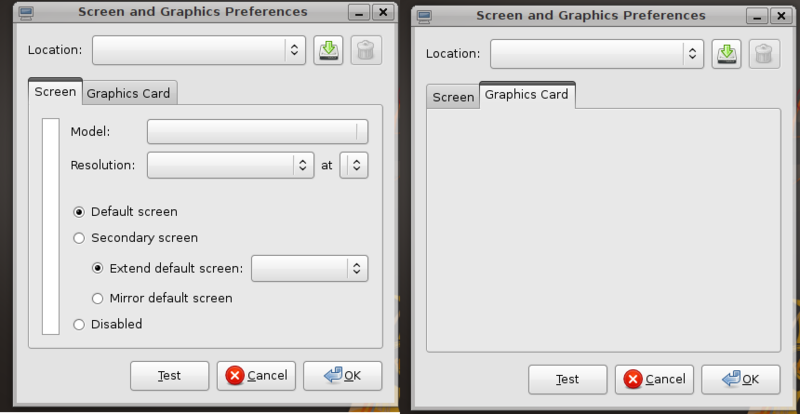 Due to these changes, displayconfig-gtk has become obsolete, and we're deprecating it in favor of an updated Screen Resolution tool which has xrandr 1.2 support. For a more detailed explanation please see bug 144641. An in depth background is also available in the comments of bug 147721.